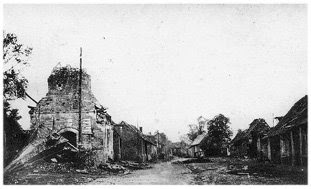 At Rancourt, west of St.-Pierre-Vaast Wood are three military cemeteries grouped together, one German, one French and one British. There are 11 422 buried in the German cemetery, Rancourt Soldatenfriedhof, of which 2/3 were killed between June and November 1916 and 1/3 between March and August 1918. The old wooden crosses were changed to stone crosses in 1972. In the large massgrave are 7492 burials - about 2/3 of these are unidentified. 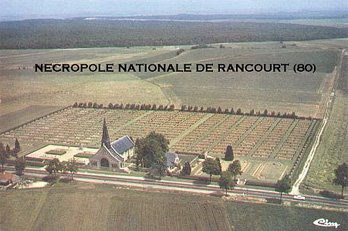 In British Rancourt Military Cemetery are totally 90 burials, dating especially from the winter 1916-1917 but also from September 1918. In the large French cemetery, Le cimetière de Rancourt, are 8 566 burials, dating from September to November 1916. Close to the French cemetery is a memorial chapel, Chapelle du Souvenir Français, built (1937) on initiative of the local Bos family as a memorial for their son and his friends who were killed the 25th September 1916. The chapel is open to the public. The forest in the background of the aerial photograph from the 1960s is St.-Pierre-Vaast Wood.